One Carbon Footprint at a Time airs Sunday, April 28, 2019 in the greater Los Angeles area at 5:30 PM on KCET. While the classroom as a vehicle for educational success remains largely unchallenged, despite often questionable levels of achievement, a few public schools across the country are trying a different approach to engaging students in the learning process, using the communities and neighborhoods where students live as classrooms - creating not only a different type of learning environment, but a different kind of student. This documentary has the potential to refocus the national debate around the direction educational reform should take. Watch trailer, read more and order online. Many economists, business owners, and labor leaders have raised alarm about a rising skills gap in the United States between the jobs that are available and those with the skills needed to fill them. Job Centered Learning, takes a critical look at the wide range of career education options some high schools across the U.S. are offering, engaging their students in life changing classroom experiences. This new one hour documentary has the potential to add to the national debate around both the vitality of our economy as well as the role schools can play in shaping how a new generation of students can find more meaningful educational experiences, fulfilling livelihoods and worthwhile careers. LESSONS FROM THE REAL WORLD - Learning to read, do math and other subjects happens when students care about what they are learning, rather than drilling them with subject matter largely divorced from their real lives. 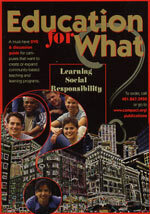 This engaging documentary provides a first hand look at K-12 schools and classes that weave community and societal problem solving through their curriculum as a way of both preparing students for active participation in democratic society, as well as motivating them to learn basic skills as part of a meaningful educational experience. Read more and order online. "Every member of Congress should be required to watch this film." DEMOCRACY LEFT BEHIND - Wonder why voters are not more informed about issues which underlie election campaigns? While schools should play a vital role their ability to serve a civic mission has been severely constrained by a narrowed curriculum and increasing focus on test scores. Democracy Left Behind, demonstrates how difficult it is for many students to understand what their education means in the larger context of the society and world they live in, while also showcasing alternative models. EDUCATION FOR WHAT? - Learning social responsibility follows some of the thousands of college students who work to solve community problems as part of their regular curriculum and examines the impact of this learning strategy on students, the community, and the ability to engage a new generation of citizens. Read more and order online. An educational experiment in participatory democracy at four schools in El Salvador that can serve as a model here in the US – where viewers see students become actively engaged in solving problems in their own communities, not as an extra-curricular activity, but as part of learning math, language, writing and other basic educational skills – skills they see as necessary to solving the issues their communities face. Coming to PBS stations beginning June 2016.
by producer Bob Gliner in the Filmography section. You are visitor number [an error occurred while processing this directive].